New Holland, Pa. (August 29, 2017) – New Holland Agriculture is expanding its acclaimed T6 tractor series with the new T6 Dynamic Command™. The new T6.145, T6.155, T6.165, and T6.175 Dynamic Command models are the only tractors in this segment featuring the new 8 step semi-powershift dual clutch transmission on the market, providing operators with a new option to further improve their productivity. The new transmission reduces the number and improves the quality of gear shifts during operation, making these tractors a valuable asset to the fleets of dairy and livestock producers, hay and forage operations, and row crop farmers. 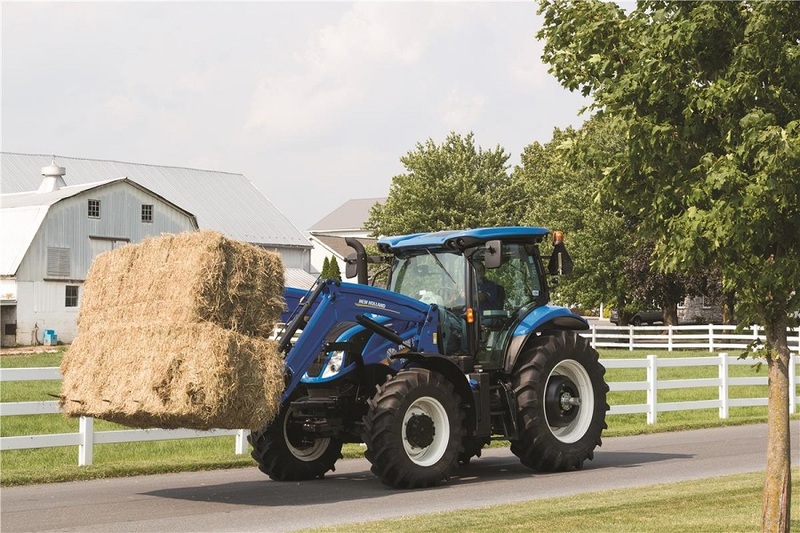 With these new models, New Holland provides its customers with even more choices. Customers who are looking for an entry-level tractor for use in the yard and light field applications can opt for the T6 16×16 Electro Command™ with 4 step semi-powershift; those requiring a multipurpose tractor for tillage, haying applications, and loader work can choose the new T6 24×24 Dynamic Command; and customers who are looking for luxury performance when exact speeds are critical can find the perfect solution in the award-winning T6 Auto Command™ with continuously variable transmission. The all new 24×24 Dynamic Command transmission allows the tractor to use less power during operation when compared to the Electro Command transmission, meaning the customer sees higher work rates with less fuel usage. At the heart of the 3 range, 8 step semi-powershift transmission is a dual clutch concept, similar to that which operates the seamless range shifting in the New Holland Auto Command transmission. The new features of the T6 Dynamic Command make a full day’s work easy by increasing productivity and decreasing fatigue, meaning operators can get more done in less time while staying more comfortable. • Dynamic StartStop: the new brake to clutch feature improves the ease of operation when the tractor is stopping frequently, typically front end loader operation. Simply press the brake pedal and the tractor will slow and come to a stop, there’s no need to engage neutral or depress the clutch pedal. Release the brake and the drive is reengaged, for simple and efficiency-boosting automation. • Auto Shift: making the operator experience even simpler, this entry level of automation feature allows the tractor to shift gears on its own based on an adjustable engine speed threshold. Depending on the task, the operator chooses how much the engine speed can reduce before a gear change is made. • Adjustable Shuttle Aggression: some tasks require the smoothest forward-reverse shuttling while sometimes the priority is faster direction change. The T6 Dynamic Command tractor lets you select between three aggression levels for the best performance possible. • Dynamic IntelliShift™ System: as the brains behind each gear shift, the Dynamic IntelliShift system analyzes engine speed, transmission shaft speeds, ground speed, load and even oil temperature to ensure each shift is as smooth and seamless as possible. • Kick Down: For the most rapid acceleration, just press the throttle fully and your T6 tractor automatically downshifts to provide you with peak power for more productivity through the day. • Transport Power Management™: when travelling more than 14 MPH, the TPM system switches the T6 Dynamic Command engine to a power curve with a different profile that concentrates more power at higher engine revolutions for more consistent tractor acceleration rates. Two versions of the SideWinder™ II armrest, New Holland’s multi-award-winning console, are available to controlling the T6 Dynamic Command. Choose from either electronic hydraulic remote valves or mechanical valves. For the mechanical option, the integrated control panel has been repositioned to the front of the armrest to provide unobstructed access to the mechanical remote levers on the right hand side. The CommandGrip™ multifunction handle is taken from the Auto Command CVT tractors. Pushing the force-based version of the CommandGrip forward will shift up gears, and pull backward to down gears. Engage reverse and the logic cleverly reverses, pulling backward upshifts, a common logic to the established speed control on the Auto Command. While operating in Ground Speed Management mode, pushing forward will accelerate the tractor towards the requested target speed, pulling backward decelerates the tractor. To create the perfect front end loader tractor the T6 can now be specified with CustomSteer™, a new variable ratio steering feature that delivers the full maneuverability of the T6 with reduced turns of the steering wheel. Repetitive maneuvering while loading is made easy, just one rotation of the steering wheel can turn the steering fully from left to right while still maintaining precise control. Add in the brake to clutch feature, a high flow hydraulic pump, an advanced loader joystick with transmission controls, the high visibility roof and you can see why the T6 Dynamic Command is perfect loading tractor. The T6 Dynamic Command can be offered with ISOBUS Class 3 capability. Hitched to a New Holland round baler with IntelliBale™, the baler can stop the tractor when a bale is formed, eject the bale and close the tailgate. The driver simply presses the shuttle button to resume baling. New Holland’s philosophy is that advanced features should deliver benefits and not bring complication for the operator. Ease of use is a fundamental design criteria and the T6 Dynamic Command is no exception to this rule.